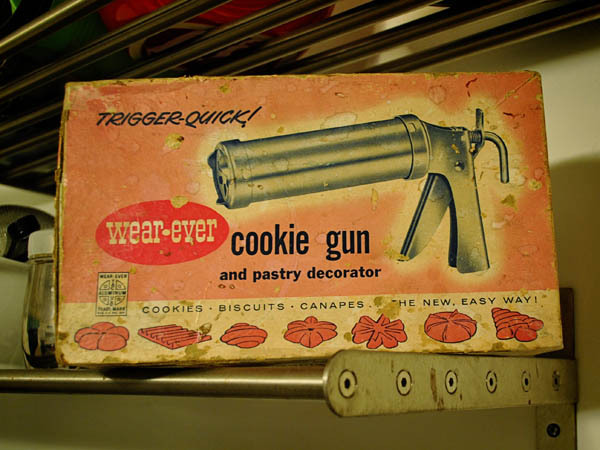 Some time ago (when I moved to my first apartment), I stole the cookie gun shown below from my grandma (love you Grandma). And now, every Christmas, I make spritz cookies at least once over the holiday season. The worn pink box and the shiny, aluminum glorified-caulking-gun inside make me super happy every time I look at them. I use the spritz recipe from Williams Sonoma: Cookies but I add some food coloring and peppermint extract (I tend to crave all things minty during the holidays). Colored sugar or sprinkles for decoration. In large bowl, cream butter and sugar on high speed until sugar is no longer grainy. Add egg, extracts and food coloring, stir until blended. Sift flour and salt together onto waxed paper and add to butter mixture by spoonfuls until blended. Follow your cookie press directions to place cookies onto ungreased cookie sheets (I use silpats on mine). 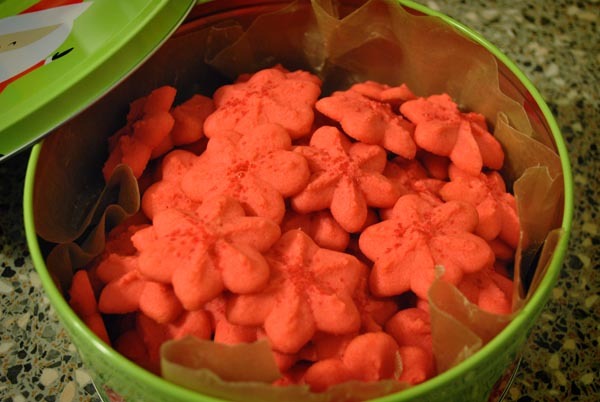 Sprinkle with colored sugar or sprinkles. Bake for 8-10 minutes until edges are golden brown. Let cookies cool on pan for 1-2 minutes, then transfer to wire racks. Makes about 5 dozen cookies, keeps well for a few days.